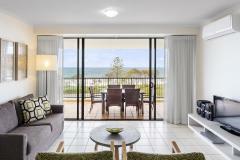 Ideally located on Queensland's picturesque Sunshine Coast, Oaks Seaforth Resort is just a short stroll from a patrolled surf beach and close to Mooloolaba Esplanade. Oaks Seaforth Resort offers comfortable one, two and three bedroom air-conditioned apartments with resort facilities. Features include a breathtaking lagoon style swimming pool, lap pool, poolside barbeque and gymnasium.